The boys, who are to form the new idol group, are playing basketball and introduce themselves. Tsumugi is enthused by their youth and charm. In a meeting with the company director, who is also Tsumugi’s father, she is asked to cut down the boys from seven members down to four. The remaining three will rival the popular idol group TRIGGER, who are with a rival agency. Whilst sharing the news with the boys, Iori accuses her of breaking their trust. The group tries to calm Iori down, and Iori and Riku become at odds about the treatment of Tsumugi. Mitsuki tries to diffuse the situation. Yamato decides that he would rather not compete in the upcoming audition and decides to walk out. His reasoning is that he was only part of the idol group as potential revenge. Tsumugi and the group convince him to at least stay for the audition. Riku looks exhausted in the corner, so Sogo offers to get him and the entire group drinks. While he’s gone, Riku complements Iori saying it must be nice to work with his older brother (Mitsuki). Yamato and Iori are back with the drinks, and while handing them out, Yamato compliments Nagi on his good looks. 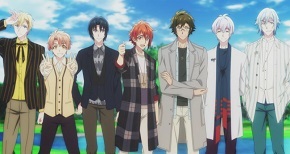 The attention shifts to Nagi and how he’s the best looking in the group. The guys make a bunch of small talk about lunch, and how they hope their wishes can come true. Tsumugi believes that all the members are suitable for the group, and each one of them have individual traits that are valuable. The Director admits that’s exactly what he wanted too, and this culling was actually a test. He tells her that Tsumugi’s deceased mother would have been proud. After Tsumugi tells the groups the results, Iori apologises to her for his comments earlier. The group brainstorm the name IDOLiSH7, but they cannot debut (release a CD) until they reach enough popularity through live concerts. TRIGGER doing an interview on TV, having won an award. Tsugumi asks the director about doing a live concert at an open venue. The group is apprehensive, but the manager assures them it will showcase their individual talents close-up. A photoshoot session happens for the marketing material, and Tsumugi asks about the boy’s various preferences for their profiles. Tsumugi spends some time building the website. After the fliers for the concert are printed, she hands them out herself at the train station. The group discovers that Riku has the best singing voice and are impressed enough to give him the main vocals. After the practice session, the group finds the manager at the train station, and help hand out fliers. Riku gets attention from girls, and reveals he is uncomfortable because his older brother usually got the attention and not him. He mentions that Sogo is similar to his older brother. The website is gradually getting more hits, and all the fliers have been handed out. The group doesn’t have any ticket sales yet, but Tsumugi planned on selling tickets on the day. The concert venue is prepared, but only a handful of people show up. The director tells her that she should do more to promote the group. Tsumugi reassures the group that their lack of audience is not because of their talent. The group is bolstered, and play it off, they expected a small audience anyway. Yamato gives words of encouragement to the group as the newly appointed leader. The group gives the performance with their small audience cheering them on. TRIGGER is passing near the concert venue in their car. They are analysing their interview comments, when they hear the concert and note the singing is good. I wasn’t expecting much from my first foray into idol anime. If anything, I was expecting a quick cash grab with colourful characters that are generic tropes in the bishonen style. IDOLiSH7 turned out to be a both a great (yes really) and a terrible anime. It’s aimed firmly at a younger female audience, with lots of non-threatening guys. Seven characters are introduced at once, which is a lot to keep track of, and although they go through names multiple times in forty minutes, I still struggled to recall them. Hence the cheat-sheet above! The show does give some great group shots. They all seem like nice guys, but it feels like the tropes are so neatly separated, you can almost “pick one out” as your favourite. To quote the k-pop community, there’s at least one bound to be your “bias”. The guys themselves are likeable, and enough information is shown about them to fill out the first two episodes. The character designs are distinct enough that you can recognise them by hair colour, unless they’re Riku or Mitsuki. I genuinely thought they were the same character. None of them stand out as memorable characters, except maybe “The Pudding Guy” Tamaki, and “The Foreigner” Nagi. The latter has the weirdest accent ever, I’ve never picked up exactly which country he’s meant to be. Is he a caricature of someone “European”? Pointless, and jarring. The overall character aesthetic seems to all over the place. Maybe I’m not familiar with idol groups as much as I think, but they seemed to go from lounge-wear to ruffled-half-shirts pretty quickly. Everyone’s hair is also constantly in their face, a pet peeve of mind in character designs. Tsumugi is a great contrast to the boys, and she may have to be, she is the singular female character so far (background girls don’t count). Her personality is clear, and it’s easy to see how she is both personally and professionally. I like the introduction of TRIGGER early on, and how much of an underdog IDOLiSH7 is. I’m a total sucker for the under-dog to glory arcs, which is achingly predictable, but we know what we signed up for by watching an idol anime. The episode itself feels pretty light, despite the lengthy run-time and a lot happening. The length does help with investing into the story. The absence of any danger and variety drags the pace down. The guys make a bunch of small talk with each other in bland surroundings, and Tsumugi talks to her dad and Banri a lot, but there’s rarely any urgency or change of pace. Everything methodically plods on towards the end. The episode tries to sneak in as much titbits about the boys’ personalities and backgrounds as much as possible. Some of them are hammered in at odd moments, see: Yamato joining an idol group for revenge, Riku being out of breath a lot, Iori and Mitsuki being brothers, and Tsumugi’s mother being deceased. Random facts, but they do help flesh out the characters. I’m thinking the later episodes will help fill out those points. Shipping wars are abundant. It’s obvious how the situations are played out to make them appear closer to one member in particular. I predict Iori and Riku will be a popular ship, they’ve had a lot of moments already. Nagi and Yamato is the second ship of the episode. IDOLiSH7 finally gets to sing at the end of the episode. Music is probably the worst aspect of this show. I’m not usually into the idol group music, there is a distinct a lack of harmonies. The actual story is more interesting than the singing. Just mute the music. IDOLiSH7 is interesting enough to entertain and intrigue. I think it will be let down by a drop in animation quality and the insufferable music, but the overall story arc is interesting to satisfy audiences. What did you think? Is there a series you want me to review? Let me know in the comments below!